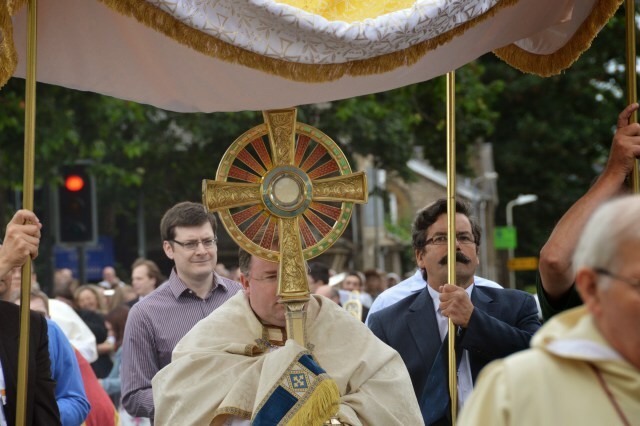 Last week we celebrated Corpus Christi and many parishes had a Eucharistic Procession. 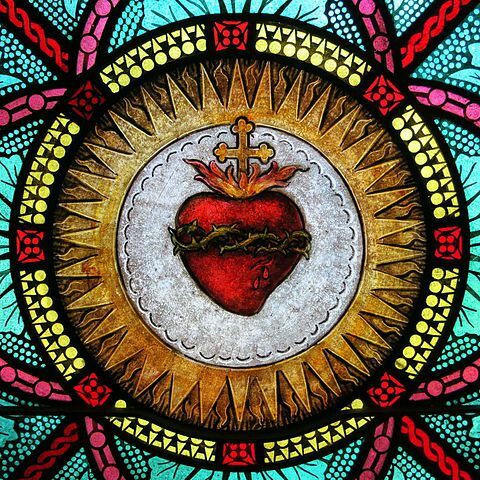 In this week’s Bishop’s Blog – I offer a reflection on the Sacred Heart! 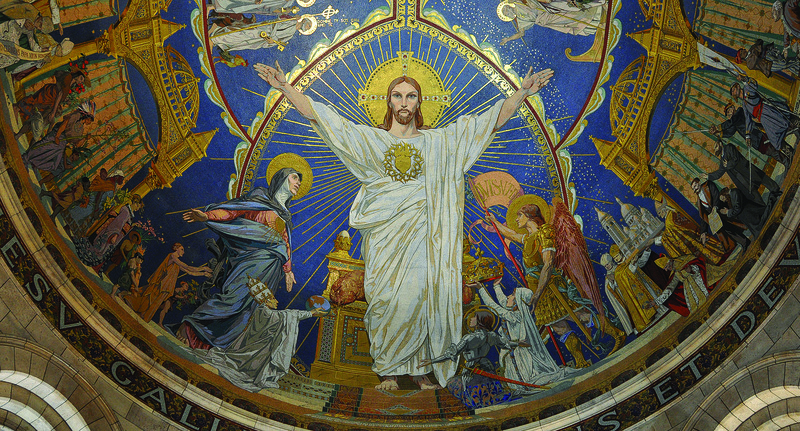 We have just celebrated, Friday past, the Feast of the Sacred Heart of Jesus, a popular and much loved devotion among Catholics. 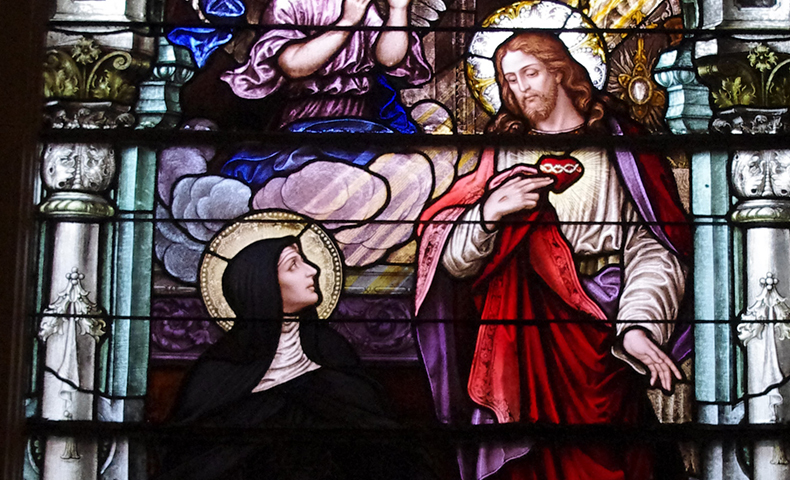 The origins of this devotion are to be found in the revelations of Our Lord to the French nun, St. Margaret Mary Alacoque (1647-1690), in which the Lord speaks to her of his heart as the symbol of his infinite love for the human race. Familiar practices, such as the Nine Fridays and Holy Hour derive from the mystical encounters of St. Margaret Mary with Our Lord. Many of our churches are dedicated to the Sacred Heart, and images of the Sacred Heart are widespread throughout the Catholic world. When we contemplate the figure and person of our divine Lord, our minds struggle to strike the right balance between his divinity and his humanity, as the Son of God and at the same time the Son of Mary. 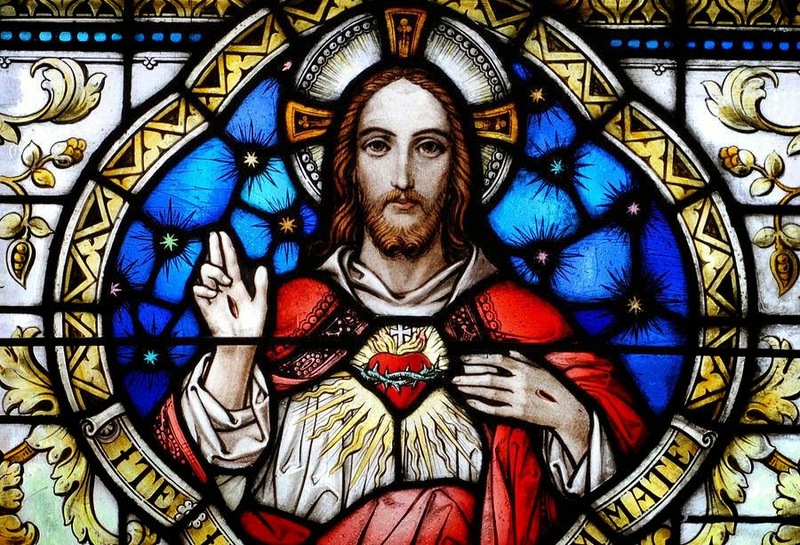 Prayer and devotion to the Sacred Heart of Jesus can assist us to grasp the reality of his human nature, for his heart beats with love and affection for his brothers and sisters of every time and place. The Evangelist John relates how one of the Roman soldiers pierced the side/heart of Jesus as he hung on the cross, showing the extent to which his love led him. Little wonder that the figure of Christ on the cross is such a dominant symbol in every Catholic church, chapel or oratory. 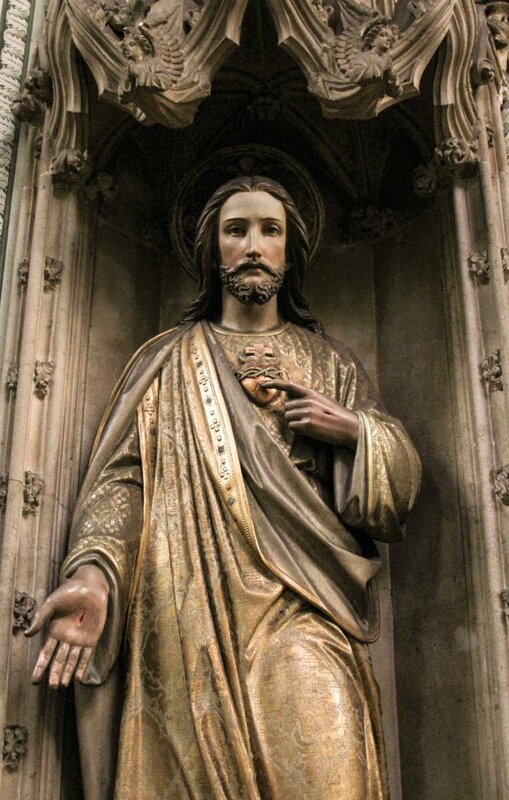 At a simple level when we look at an image of the Sacred Heart we can realise he was human just like you or I, and that his heart is large enough to embrace us and understand our own personal situation and the problems we face. 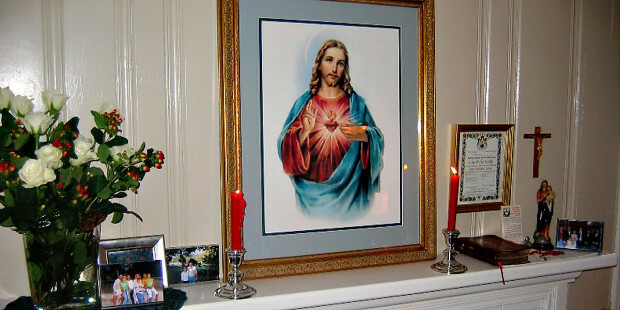 The hymns and prayers surrounding the feast and devotion to the Sacred Heart are an invitation to enter with faith into the Lord’s heart and find there rest and repose. The gospel passage for the Mass contains the wonder words of invitation and reassurance from the Lord Jesus that when we do come to him he will give us relief from the burden and heat of the day. The utterly unique and ever valid invitation of the Lord to come to him for rest and respite from the cares of daily life has found an echo in the lives of faithful souls ever since he uttered them. 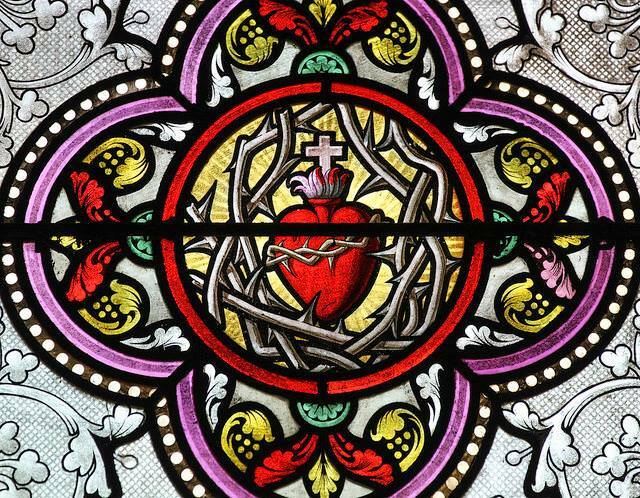 This lovely and consoling feast of the Sacred Heart stands as a reminder that there is One we can turn to in the troubled and uncertain times in which we find ourselves. Only he could extend such an invitation to come to him and find rest and peace. 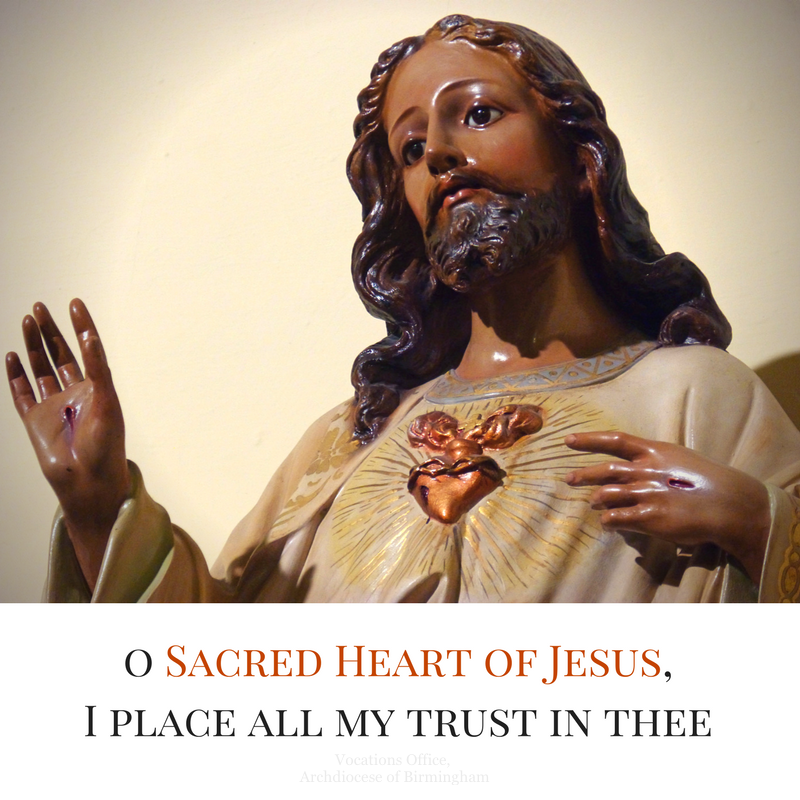 So dear brothers and sister; let us draw near to that Sacred Heart, and in the words of the time- honoured invocation say, O Sacred Heart of Jesus, I place all my trust in you! Corpus Christi – Let us Adore! 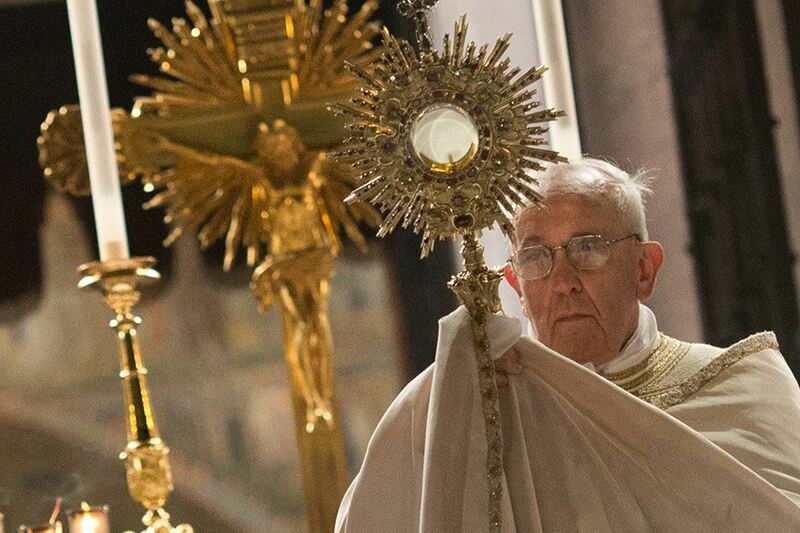 This Sunday is the Solemnity of Corpus Christi, and through the streets of Rome as throughout the Catholic world the Blessed Sacrament will be carried in procession to honour Our Lord Jesus Christ truly present in this most wonderful of sacraments. I have reflected recently on what appears to be a revival of processions at parish level in Catholic popular piety, and how walking with others addresses a felt need within the Catholic soul. 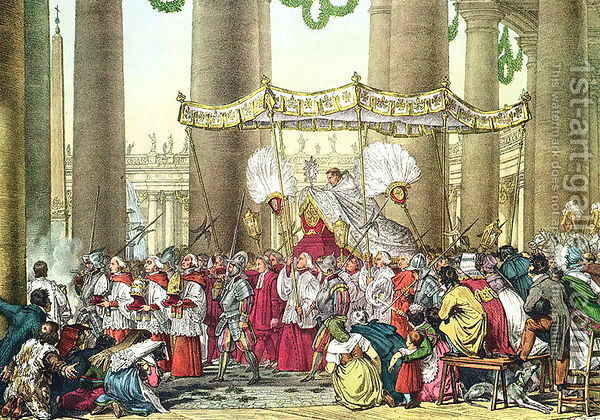 For many centuries Corpus Christi processions have long been a feature of Catholic devotion. When we venerate Our Lord’s presence in the Blessed Sacrament in this way we are honouring the memory of him who was crucified and rose for our sake, or what Scripture calls ‘our salvation.’ Eucharistic adoration is an act of faith in Jesus Christ, the Son of God, who became man, and whom the Church professes continues to be present to us as the bread of life, the living bread come down from heaven. Devotion to the Lord present in the holy Eucharist, outside the celebration of Mass, has become an established part of Catholic practice. When we enter a church, great or small, we instinctively look for the tabernacle, which quickly becomes the focus of our attention and prayer. I visited a church in our Diocese of Lancaster recently during the Forty Hours devotion where the atmosphere of hushed mystery and deeply reverent silence were almost tangible. The literal meaning of the biblical phrase ‘The Word became flesh’ (John 1:14) is that he pitched his tent among us. This is a powerful image of the Son of God taking up his dwelling in our world, and he still dwells with us in the Blessed Sacrament in our churches and chapels in every part of the world. Whenever we walk in procession following our Eucharistic Lord in the monstrance we are engaging in a symbolically deeper journey, reflecting the experience of Israel of old as they journeyed through the wilderness on their way to the Promised Land. Those ancient Israelites had the reassurance of God’s presence who went before them ‘in a cloud by day, and a flame of fire by night.’ The Ark of the Covenant containing the tablets of the Law which accompanied them was a further sign of God’s protective presence with his people. So when we set out in Eucharistic procession we do so as the people of the New Covenant, with the Lord in our midst in his Eucharistic presence. 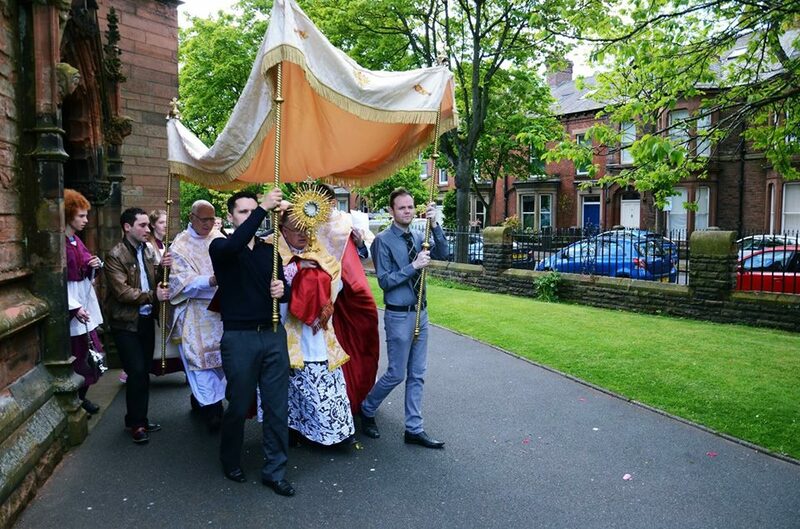 Let us see our procession this weekend of Corpus Christi as reflecting our life’s journey in the company of God’s people on our way to the Kingdom of Heaven. Christ is the new Moses who leads and guides us on our way through the hills and valleys of this life with sureness of hand, for he is for us the Way, the Truth and the Life. 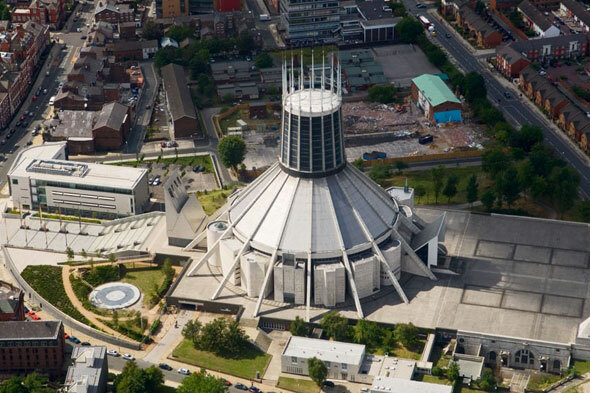 Today, its seems most opportune for me to extend an invitation to everyone in our Diocese of Lancaster to come on pilgrimage to a National Eucharistic Pilgrimage and Congress in Liverpool next year (7 – 9 September 2018) called Adoremus (let us adore) which the bishops of England and Wales are organising. Eucharistic Congresses are gatherings of clergy, religious and laity which celebrate and promote an awareness of the central place of the Eucharist in the life and mission of the Church. 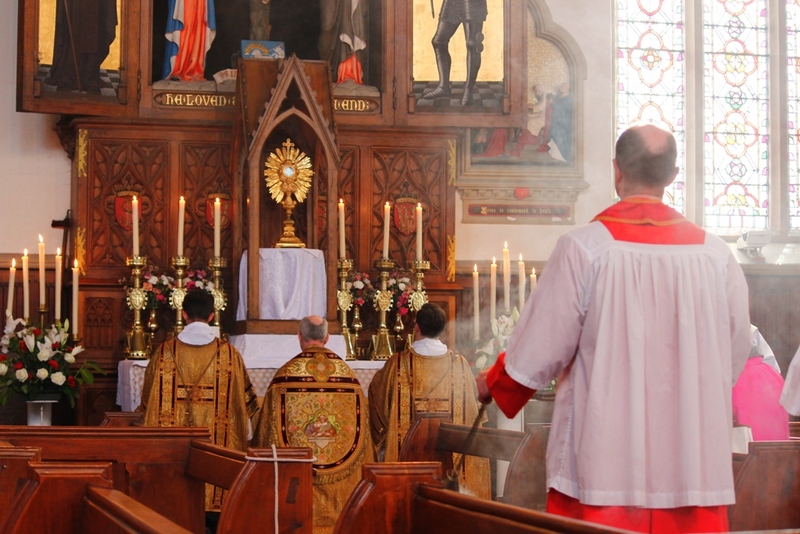 The last International Eucharistic Congress in England was held in 1908 when, in fact, permission for a public procession of the Blessed Sacrament was refused. Participants will engage in a series of sessions focusing on different dimensions of the Eucharist and the daily celebration and adoration of the Blessed Sacrament. On the final day of the Pilgrimage and Congress, Sunday, there will be pilgrimage Masses and a big street procession – open to all. Plenty of details will follow in due course. A blessed Corpus Christi to everyone! Reflecting upon the Mystery of the Blessed Trinity! Welcome to this week’s Bishop’s Blog – which centres upon the Blessed Trinity! When we speak of the mysteries of our faith none is more profound and far surpassing our powers of understanding and speech than that of the Blessed Trinity, whose solemnity the Church celebrates this Sunday. Each time we make the sign of the cross we are explicitly professing our faith in God as Trinity – Father, Son, and Holy Spirit. The early Church required several centuries of prayer, debate and reflection before finding the approximate concepts or terms in order to speak of this triune mystery of the godhead, three persons but one God. Furthermore, it must be remembered that these theological terms resemble signposts more than an explanation of the mystery. We human beings are limited and finite, whereas God is infinite and eternal. St. Augustine’s observation is appropriate here when he says that we first believe in order to understand. Of course, we know and believe that our God is not just a series of concepts, of neat but obscure and difficult theological terms. When Moses encountered God on Mount Sinai, the God who spoke described himself as the God of tenderness and compassion, wanting to be close to his people, and ever ready to pardon their faults. He is not a distant figure, but with a gracious nature, kind and full of goodness towards human beings. Jesus Christ spoke lovingly and reverently of this God as his Father, and ours. In other words he has allowed us to share his filial relationship with his heavenly Father, and so we have the astonishing privilege of addressing God as our Father. We might call this Christian adoption. The exquisite passage from John’s gospel in Sunday’s Mass speaks of the extent of God’s love for us that he has given us his only Son. That Son, as the mystery of the Trinity teaches, has been with the Father from all eternity, a truth that our minds struggle in vain even to begin to comprehend. The New Testament makes mention of the Holy Spirit on numerous occasions, and before he left this world the Lord Jesus promised his disciples that on his departure they would be ‘clothed’ with another power, to be their advocate and defender. That power, our faith teaches us, is the Holy Spirit, who is, as it were, the completion of the Blessed Trinity. Images or artistic depictions of the persons of the Trinity, although far removed from the reality, can help nourish our piety in the Three-in-One. Michelangelo’s celebrated and powerful work of art in the Sistine Chapel which portrays God creating Adam always leaves a deep impression on me of the infinite power of God. 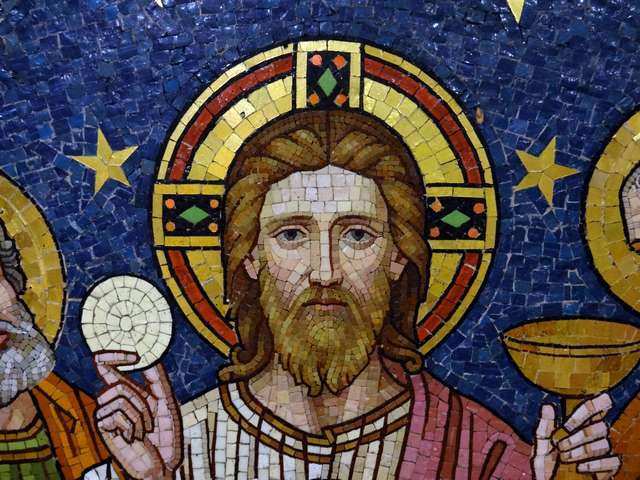 I find equally moving the Orthodox representation of Christ as ‘Pantocrator’ or ruler of the world which we see in icons, an image which mysteriously attracts and which a person never tires contemplating. When I have had the good fortune to be in St. Peter’s Basilica, Rome, the alabaster window at the very back of the basilica whose centrepiece is the Holy Spirit as dove never fails to touch and inspire me as an example of religious art at its very best. Prayer to the Holy Spirit somehow becomes easier by simply gazing at this endlessly attractive window. So while we stand in awe before the mystery of the Blessed Trinity, let us make our own the wish of the apostle Paul to the Corinthian Church which concludes today’s second reading: The grace of our Lord Jesus Christ, the love of God, and the communion of the Holy Spirit be with us all! A happy and truly blessed feast of the Trinity to all of you! 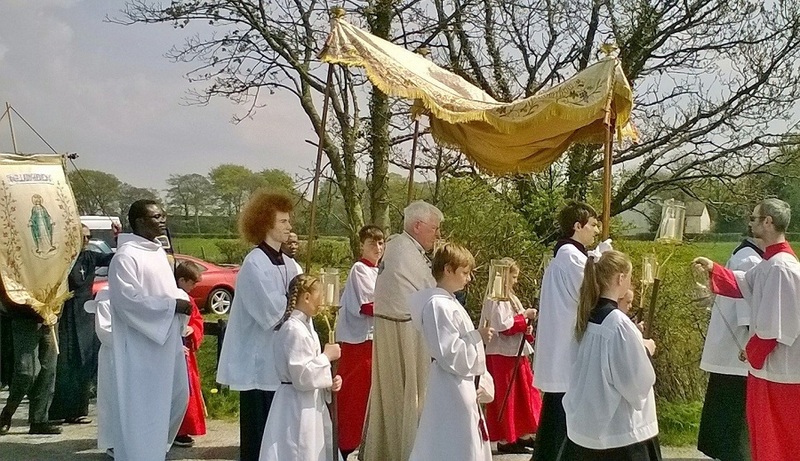 Welcome to a pilgrimage/procession themed Bishop’s Blog for this week! 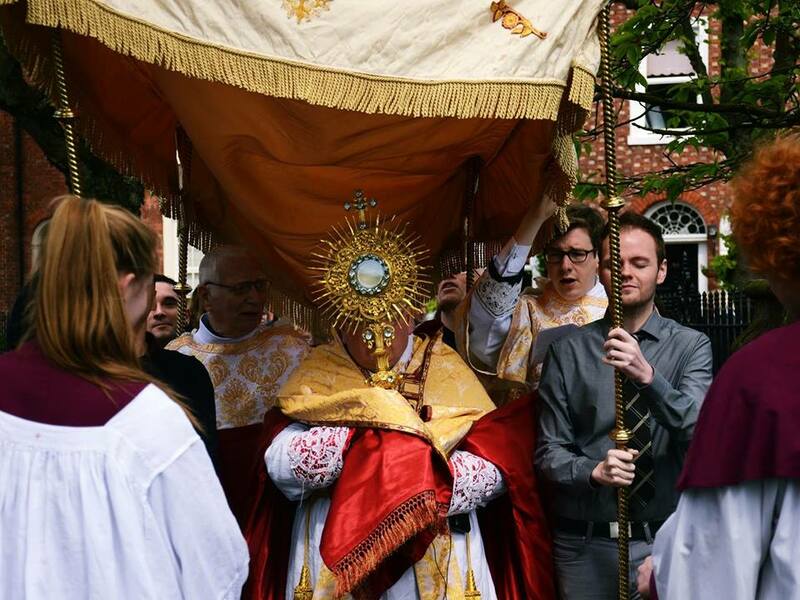 Parish processions during the month of May and around the feast of Corpus Christi, familiar to an older generation of Catholics, are becoming once again a noticeable feature of Catholic life – and even with younger people. 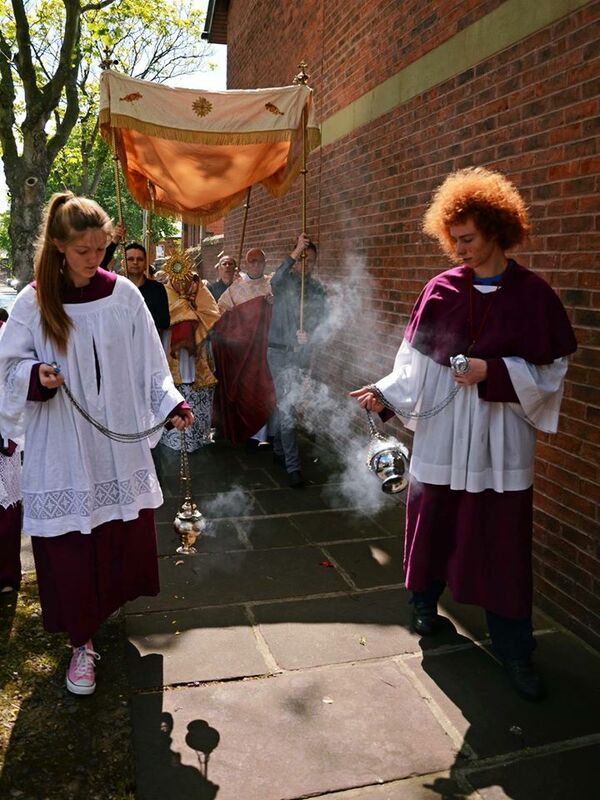 In the Diocese of Lancaster processions have taken place recently both in Preston and Blackpool, and which were well attended by both children and adults on both occasions. Last Sunday after celebrating Mass in St. Walburge’s splendid church, I crowned the statue of Our Lady of Lourdes before leading the congregation in procession in Mary’s honour around the church grounds. Such expressions of popular religious piety and devotion do seem to meet a deep need in Catholic souls. Pilgrimages and processions are inseparable. 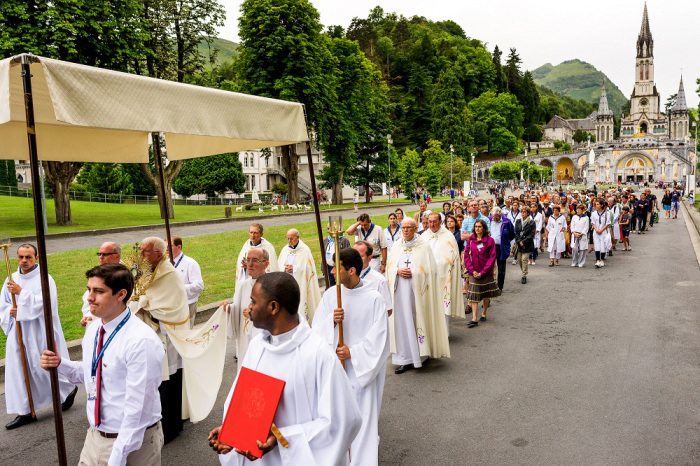 In our own diocese, for example, we have the annual Lancaster diocesan pilgrimage to the ancient shrine of Ladyewell, close to Preston on Saturday 8 July, followed by the annual Lancaster diocesan pilgrimage to Lourdes, beginning on 21 July – young people are still welcome (contact here)! The shrine to Our Lady of Lourdes at Cleator, West Cumbria, hosts its annual pilgrimage on 10 September and the season concludes with a four day Lancaster diocesan pilgrimage to the equally ancient and hallowed shrine of Our Lady at Walsingham, which starts on 26 September. Such places of pilgrimages, and of course there are many others, are always places of prayer and spiritual renewal. Taking the time to go on a pilgrimage, be it simply for a day or longer, is never without its reward, and pilgrims return refreshed and content that they have made the effort. So I encourage people to go on pilgrimage. As I have written previously, pilgrimage and spiritual quest have a long tradition, both within Sacred Scripture and in the great faiths, such as Judaism, Islam and our own Catholic faith. To walk with other believers in procession means leaving our daily routine behind for a while, and allowing ourselves to be touched by grace of God so as to see our lives and our concerns from a different perspective. The united prayers of so many in procession during a pilgrimage will without doubt, in the words of the sage, ‘pierce the clouds of heaven.’ Nor should we forget the words of the Lord himself who assured us of his presence where two or three are gathered in his name. The busy and ever-changing pace of modern life imposes many demands on us. When we go on pilgrimage or even walk locally in a parish procession we become more aware of others, and of our common humanity, and it is through the simple act of going in procession that we get a glimpse of another and more spiritual world. In turn, we are touched by something and Someone greater than ourselves, and can only be better for the experience.